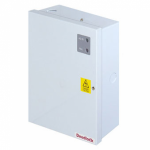 The 12v DC Switch Mode Power Supply Small Case ADP121A is a high efficiency, cost effective switch mode power supply to be used with Access Control, CCTV and general purpose applications. Modular construction allows for simple maintenance and upgrade capability. You'll need a 12V power supply for a consistent running of your security systems or other purposes you may use it for. But with 12v DC Switch Mode Power Supply Small Case ADP121A it features just one amp making it suitable for use on small systems that requires only one power source.